On August 12th, I received notification from Fulger Transport that we had been selected for their monthly sponsorship. 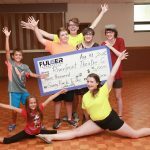 Every month in 2016, Fulger has selected a charitable organisation in our area and donated $3000 to that group. As you can imagine, I was over the moon! Riverfront depends heavily on community sponsorship, and this was a big donation for us! Only a few days later, I learned that one of our storage locations would no longer be available to us as of the beginning of September. We moved all of our costumes and props into a new storage facility last week, and I have to tell you, this donation could not have come at a better time, as our budget is adjusted by almost precisely this amount for the coming year! 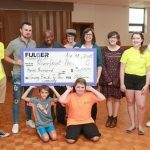 We had hoped to use these funds to supply more microphones to our students during our performances, so I will still be on the lookout for more donations to reach that goal – but we couldn’t be more pleased that Fulger has partnered with us with such fantastic timing, and so generously. Thank you also to Simon Wyn Edwards of Snapd Windsor for attending the cheque presentation yesterday, and providing us with this coverage of our happy event! I attach these photos with his permission. You’ll notice we had some of our Riverfrontiers available to attend the cheque presentation – on fairly short notice, and not on a Saturday, it was a challenge. What was particularly delightful to me was that two “extra” children, belonging to one of the Fulger team, just jumped right into the picture (absolutely invited to do so!) and fit right in – immediately and intuitively knowing how happy I always am to see a group of kids doing jazz hands! The Riverfront kids present in this photo represent 5 out of our 55 actors we have this season! We begin rehearsal tomorrow, and look so forward to a brand new season with almost every face from last year returning, and several more added in! We are bulging at the seams, and glad of it! Juniors – The Best Christmas Pageant Ever, at Paulin Memorial Church on December 17 and 18.